It might have been less than 100 pages but chapters 1 through 5 had a LOT of story to absorb! Below are my thoughts on this section, some discussion questions for you to respond to, and a reminder about the next section & photo challenge. Well, the story really kicks off with a bang! The prologue set the scene (gloomy and gothic as some of you observed) and the first 5 chapters really plunged us into the story. There were a lot of new characters introduced, but I never felt like there was too many to keep track of, as each was given time and context to settle in. Gaiman’s playful way of describing characters had me smiling more than once, and you can really see they joy he took in writing them. In particular I loved his description of Mr Croup and Mr Vandemar, which included 4 helpful differences and ended with the phrase “Also they look nothing at all alike”. This is a hard section to discuss because there is so much contrast between Richard’s time in London Above (with Jessica and the challenge he has at being the ‘competent’ boyfriend she wants him to be) and the quite literally dark and gritty world of London Below. To me the descriptions of Richard’s life in London Above just reinforce how hapless he is. He is not the hero of his own story, he doesn’t quite fit in, but bobs along with the crowd, until a tipping point – Door’s appearance on the street – where he surprises everyone, including himself, in doing what he thinks is right. My favourite scene was the journey to and crossing of Knightsbridge. It really underscored how brutal London Below is, and introduced Hunter, who I am looking forward to seeing more of. 1. How are you feeling about Neverwhere 100 pages in? 3. Richard says that he had had “nightmares in which he simply wasn’t there” as a child and had the awful experience of having this come quite literally true. This stood out to me as a moment to reflect on the anonymity of the cities we live in and the ‘bubbles’ we create for ourselves, and I have often felt that sensation of being invisible living in a huge city. Did this or any other moments in this section really resonate with you? 4. 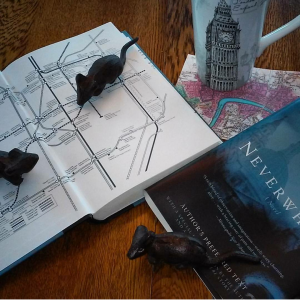 Gaiman is known for his vibrant and creative descriptions, do any of the places in Neverwhere so far appear really vividly in your imagination? Photo Challenge: #booksanddoors – In the prologue Richard is warned to ‘beware of doors’ and this week we met Door and travelled through a great many doors, and even discovered a house with no doors! Doors are a recurring theme throughout this book, so come up with your most creative interpretation of ‘books and doors’. I, myself am really enjoying this one. The setting is great and the humor really dry and oh so British. My favorite quote is when Richard and his colleague are talking about Jessica – I wasn’t able to copy it down in time while listening! I totally understand where Richard is coming from with that fear of being lost or forgotten. I remember feeling that after leaving high school and I slowly stopped seeing friends and just all of my other fellow students. How after 6 years of seeing someone everyday could be irrelevant only 6 months later. It’s an odd feeling. I am actually struggling a little to picture the characters, it could be that I ak missing details whilst listening but I am having no problems imagining London below and that I am really enjoying! I’m so glad you are enjoying it. It will be really interesting to hear how the experience of listening to it differs to reading. Already I know you have mentioned the weird music (which I really can’t explain), but I do see where you are coming from with the characters. They tend to get described as if you are looking at them through a peep-hole, one little detail here and there and you are left to imagine the rest yourself. It’s an unusual style for sure! Oh my goodness! If the truth is told, I am a bit of a book whore; in that when I find a book I really like I do fall madly and deeply in love and proclaim this book, above all else, is my favourite (until the next week when I move onto my next book obsession haha). Neverwhere is, I’m happy to gush, my current book love 🙂 Gaiman’s writing style was just so easy to fall into, to a point where I was speed reading just to see what happened next. And the range of characters – I mean – my god, even Jessica! Can we take a moment to appreciate how accurately Gaiman has captured the spirit of “that type of girl” in this minor character? Who has not known a type of girl like Jessica in their lives? I found myself giggling in the beginning with, yep, I know a couple just like this – and he’s recreated that special type of awful to a tee! Richard had noticed that events were cowards; they didn’t occur singly, but instead they would run in pacts and leap out at him all at once. The idea of being invisible, or alone in a crowded room so to speak, really resonated with me in regards to anxiety and mental health. While my own mental health is a lot better than it used to be, that feeling of isolation and loneliness in crowds I’m sure would not be unfamiliar to anyone. For me in particular, being in cities like Melbourne by myself without any actual goal and just aimless wondering actually really depresses me, and Richard’s breakdown in the sewer at the realisation that he’ll be ignored forever in his familiar world was really …. well it had me feel the feels. Corrinna, OMG! As I read your post I’m thinking “did she write this, or did I?”. I swear your thoughts and feelings are so very close to mine! I’m a so in love with Gaiman right now and I’m obsessing over this book. I can’t get enough and I struggled really hard not to read on past Chapter 5, but I can’t wait to continue on tonight. I will pull my thoughts together a little better so that I can post something that does not repeat everything you said (LOL). You are spot-on with your descriptions, and I am feeling the exactly the same way about these characters and this book. Your thoughts are so well said about this book! I love that you pointed out how Gaiman even captures Jessica’s character perfectly (because we’ve all known “those girls”). The quote you chose as your favorite was also one of mine. It’s such a great line, and so true about life in general. 🙂 Love your comments! Ah so insightful! I think I’ll have to get you to write my blog posts for me! Your comment about Jessica is ‘en pointe’ she is a relatively minor character but she is described just enough to give a clear picture of who she is, and to place Richard in stark contrast. The scene on the bridge was the most significant for me too, it was just so sudden, unexpected and brutal in its delivery! Can’t wait to dive back in and read some more! Haha thank you Tam, Holly and Dena 🙂 I posted then wasn’t able to get back on due to work/family drama but I do appreciate your lovely comments and I’m happy to see I’m not the only one whose loving even his minor character descriptions! Corrnia, OMG Yes!!!! My own mental health issues filter the way I perceive things, and it made me very emotional when Richard realized he was alone and invisible. That is a feeling I relate to entirely too well. And I agree regarding Anesthesia’s death: it’s as if it took that final breaking point for Richard to actively participate in his own life. It was such an emotionally effecting point in the narrative, I literally gasped and looked around at my work colleagues (I often read on my lunch break) and was annoyed at having no one to share that horrible sinking feeling with 🙁 That’s why I really appreciate this forum, so I can vent on here and say wow, please tell me I wasn’t the only one to be really affected by this right?? I’m with you! When I read that part, my heart just sunk. I was home alone when I read it and felt lost, having nobody else here to understand why I was upset. It was very emotional to read that part. And as I read further, I’m still feeling the loss. I’m going to be honest, I’m struggling with this book already :/ I love Gaiman’s writing style and he has an amazing story telling abilities but the actual story is just not sitting well with me at the moment. If I wan’t reading the book as part of this read-along then I would have put it down to try again later. But no, I am going to push through and see where this journey takes me! I agree, Melissa. I love Gaiman’s writing, his descriptions are incredible, and I can clearly visualize the entire story in my head. I enjoyed the prologue a lot, too. That said, there is something that just isn’t grabbing me like his books usually do. I don’t know what it is, but if not for this read-along, I’d be setting it aside and trying it again at another time. I’m going to read something I bought yesterday and go back to this one in a few days. Maybe a different mood or mindset will help for me. I am going to finish it either way, but I am hoping that I can start enjoying it more pretty soon! I’m glad you have both been able to share this, it’s interesting to hear it isn’t grabbing you like his other work. To be honest I have a sort of similar feeling, I don’t think this is his most engaging plot, but because I have read it before it is like rediscovering all the things about his style that I loved. It is interesting to remember that this is his first ever published novel. So it might be interesting to read it through the lens of being the foundation stone for the rest of his work, look for the things that have evolved in his writing and the things that have stayed the same. I didn’t know this was his first published novel. That makes sense, though. It definitely is not as engaging as anything else I’ve read by him. I am still trying, and have quite a “love it or hate it” relationship with this book. It does grab me once in a while, but that is rare. For the most part, if I’m immersed in reading, I’ll enjoy it, but when I put it down, it takes a lot of effort for me to pick it back up. I’m behind on reading because I just can’t get myself to want to sit down with it. I’m still working my way through it, though. My favorite descriptions of place throughout the text thus far… there were so many of them! I guess the three I could visualize the best had to be the market scene, Door’s “house” (this is such an insanely creative idea! ), and the crossing of the bridge to get to the market. When they were crossing the dark bridge… I had chills. Gaiman captures that feeling of complete and utter aloneness and the horror of not knowing if the person you entered the darkness with will come out by your side or not perfectly. Then to not know what happened to poor Anaesthesia… her character was like the sweet little sister who got caught in the midst of a crazy world. I agree! Now that I have read the Introduction where he talked about childhood stories I have been keeping an eye out for references and there have been a few direct ones to Alice in Wonderland and as you said many references to things that scare kids, fears we carry over into adulthood. Richard’s nightmare, in my opinion, even started before he became actually invisible. Although he was in a relationship, Jessica never really “saw” him. The anonymity and loneliness of the city transferred into Richard’s private life. What’s worse than living with a person and still feeling lonely? If we look back to the prologue, Richard also even does not seem to have very close friends. So actually becoming invisible could be a changing point for him, like a rite of passage, where he gets to get to know people, become real friends, experience thrilling adventures on the way and even find love. A love that is based on taking the person for who they really are. And then, he will become whole. Visible for everyone around him – and especially himself. I love how Gaiman paints his villains, they are hilarious! 😀 I feel like the story and the villains are reminiscent of Charles Dickens’s novels. And the “below” really feels like a 19th century world, don’t you think? At least from the descriptions, that’s how I imagined the market to look like. Well, I am happy that I now can continue with the story!! Have a happy sunday everyone! I loved the descriptions of the Market too! Your insight about his invisible life with Jessica is really accurate, I hadn’t thought about it in that way. He certainly does not seem particularly happy in that life. But in the next section we will see him strive to reclaim that life, and I think that tarnishes his ability to live in the moment with all the incredible things he sees and people he meets. I had a simmilar feeling about how Richard was seen through Jessica´s eyes or, rather, how she wasn´t really seeing *him* at all. She didn´t like his appartment, so she never went there. She didn´t like his troll “collection” so she pretty much ignored it. She constantly thought he´d be great if he´d changed this or that. So, he, as he was, wasn´t what she wanted, and the things she didn´t like, she pretended they weren´t there. Is there an even worse way to be invisible to the eyes of someone who´s supposed to love you and you supposedly love? I am really enjoying this book. I love how Richard Mayhew is so real. He is kind of the guy that just doesn’t quite fit in, the unassuming fellow who people tend to ignore. Yet I find him charming and adorable and could love to go on an adventure with him. I was so glad he stepped up and helped Door when he found her bleeding on the street. Which also brought about the end of his relationship with Jessica, who had to go (IMO)! It is true that life can turn on a dime – one simple act can change your future and all it holds, as Mayhew has discovered. I think I was in just the right mood for this book. It just has hit me in the right way; the writing, the characters, the dry humor – I’m loving it all. I laughed when Anaesthesia asked Richard if he “liked” cats. I knew exactly where she was going with this, and knew that he didn’t. Ugh. Poor cats. The London Below really does feel 19th Century (I agree, Sandra), and a bit mythical (Narnia?). I can clearly visualize it all, which to me makes it all the more fantastical. I’ll pay more attention to my reading this time and mark my favorite parts / quotes / story-lines so I can write a better post. I was so wrapped up in the reading last time I did not take notes and clearly my little blurb here reflects as such. All in all I’m thrilled to continue on and can’t wait to see what happens. Happy weekend to you all! If you get caught up in resding don’t worry about notes! Impressions are just as important! I’m glad you are enjoying it, I find myself daydreaming about London Below, imagining what it is like, all the places are so vivid. Corinna, Dena, I feel the same. I really loved this book! I put it in the past because I could not help not reading it all in a few days. Gaiman’s style had the power to really draw me into the atmosphere are the world he created. I was amazed starting from the beginning. The first 5 chapters really managed to sketch the clear dissonance between London Above and London Below, not only through the setting but through the characters’ actions. Honestly, when the “Door” warning was told, I had a hunch that something bigger was coming up, I got really curious. I was also feeling quite safe until the bridge also, and the radical and sudden disappearance of Anaesthesia was like a wake up call. It was all magical, but the serious kind where really anything could happen after that. A part that I especially liked was when Door sent the pigeon with the message to the marquis de Carabas. And how Richard sees Door: “And her eyes… Richard realized that he could not tell what color her eyes were. They were not blue, or green, or brown, or gray; they reminded him of fire opals: there were burning greens and blues, and even reds and yellows that vanished and glinted as she moved.” I really liked how Gaiman manages to describe everything so magically, so purely. Gaiman really does have a flair for piercing descriptions that cut through. This was his first novel, and though his style has evolved and matured that flair for description has remained his signature. I’ve really loved this book so far, so much so ,y friends are getting annoyed with me for talking about it all the time. It is really the ideal book for me due to the vivid imagery that drew me in to start with. I liked how ominous it was and how it made me want to see what trouble that Richard is going to find himself in. I defiantly understand where Richard is coming from with feeling lost and forgotten. I’m in my last year of high school and it’s only dawning on me now how Unknown I really am there, I stuck to closely to the same group of people for the last seven years and it’s caused me to be forgotten by everyone else. Gaiman’s description of London below appeared really vividly to my imagination and I keep picture it to be a very creepy and 19th century like. I can’t wait to read more of this book! London Below certainly has a 19th century feel, like something stuck in the past (though many characters we are yet to meet are much older). So glad you are enjoying it, perhaps your friends will become Gaiman fans too! Sorry I am going to keep this really short (baby is asleep on me whilst I type on my phone). I love moments in books where you are transported into a completely different time and space – and it’s a memorable trip. I find London below and the market place to be like this – which takes me back to the first time we enter Diagonal Alley in Harry Potter. The clothes, the smells, the bizarre sights and movements of the crowd about us. The mind enters this completely different world that is so immersive and I think that is the key to a good writer; one who can take every day life events and surroundings and twist it enough that it transforms from mundane to magical. (Sorry it’s 12:15am and I’m sleep deprived) so I hope this reads okay. Do you think this is a name she gives herself? Numbing her to her past? i really would have liked to know more about the darkness and its relevance in the book. It comes up quite a few times. These unknown dangers of the dark I think help with the creation of fear within the story / made me feel like a little kid again alone in the dark. Ooh I love your observation about Diagon Alley! That perfectly captured my idea of The Market, both being so chaotic and strange but also familar as a place where people are buying and selling goods. You KNOW what as market or shopping area feels like, and though the products are different many things are the same. Wonderful! I am loving this book so far! It bizarrely was kind of reminding me of The Hobbit at the start…Richard’s unexpected journey. He was certainly a bit Bilbo-ish in his reluctance to accept things and change to his world and how nothing seems ‘real’. Then it takes a less Hobbit like path. I’m eager to know more about the characters especially Hunter, the angel Islington and Door and her family. I love Gaiman’s play on London place names and figures (like Islington and Night’s Bridge). He makes the known unknown. My favourite quote from this section was “All fire burns, little baby. You’ll learn”. Later you realise this is a warning more to the poor Anaesthesia than Richard. I’m hoping she reappears but I don’t think she will. Gaiman made it all real with this characters death. The moments that resonated with me were the crossing of Night’s Bridge…I think we all know that feeling of being in the dark! The places that are really vivid in my mind are Night’s Bridge and the market. Such great descriptions. This is why I love reading with friends, Bilbo’s reluctant journey is an excellent parallel to Richard’s reticent approach to London Below! I shall think of Bilbo as we read on. And I’m excited to read more about Hunter too, she’s fascinating! The first time I read this section, it didn’t grab me. I struggled to get through it, and only did so for this read-along. But I certainly am glad I did because I just finished reading it for the second time and I’m finally enjoying it! I love how it feels as though I’m down the rabbit hole with Richard. The writing is so incredibly descriptive that I see and feel everything as the story goes on. Even with a lot of characters happening all at once, I am not finding myself lost or confused. It took a while for Richard to grow on me. He’s so beige, in my opinion. He’s not living his life, but rather letting his life live for him. He is passive and disconnected and just seems to float along, letting things happen to him. Until Door’s arrival, of course! I like seeing Richard grow and take action. Gaiman’s writing is spectacular at letting the reader feel immersed, as though we were in the story itself. I’m hoping this continues to keep my interest as I read on to the next chapters! It’s hard to pick a favorite quote, but one that really stuck out to me was from when Richard first encountered Hunter. She said to him, “Darkness is happening…Night is happening. All the nightmares that have come out when the sun goes down, since the cave times, when we huddled together in fear for safety and for warmth, are happening. now…now is the time to be afraid of the dark.” This part got to me. It felt so real, so perfect, and as I read it, I felt like I was becoming surrounded by darkness. I am off to read the next chapters for the upcoming discussion! YES!! Exactly this! I got chills when I read that, and felt like the walls were closing in on me. I do admit to turning more lights on before I read any further! So glad you gave it another try, and we could help you along the way. I really do think that this being a first novel has some impact over the flow of the book, but I do so love all the creative characters and settings that they are plunged into! It helps having this discussion going on…not only do I get other opinions, but I know I’m not the only one who is struggling to really stick with this. Knowing it’s his first novel definitely gives me a different perspective on reading it, though. I had forgotten just how distinctive and rebellious Gaiman’s writing style is. He doesn’t really follow the normal rules or conventions and he laughs in the face of tropes or cliches. (I’m not saying he doesn’t use them at all, but he twists and reshapes them until they’re almost new and you’re sure you’ve never come across them before.) Take the Alice down the rabbit hole comparisons (and they only increase as the story progresses), they’re so cleverly woven into the story – he builds on them rather than simply borrowing from them. I don’t think I could pick a favourite quote – or even a character, but I’m in awe of Mr Croup and Mr Vandemar. For two well-spoken, language-loving, etiquette-observing ‘men’… They are terrifying!!! Seriously, shivers. I think the scene on the Night’s Bridge really stuck out for me and I wasn’t sure why until I read Corinna’s comments above. She’s absolutely right: this is a subtle but real turning point in the book, where everything stops being actually quite comical and charming and is revealed as really rather dark, scary and sad. Corrinna really nailed it didn’t she?! Our resident librarian does it again with the insightful comments! I can’t chose a favourite character either, it is rare in a book with so MANY characters for them to all be so vivid and memorable. Mr Croup & Mr Vandemar terrify me, but I am also in awe of how they are written. Hunter and the Marquis are probably my favourite side characters, the Marquis reminds me a little of Cat from Red Dwarf (at least that’s how I picture him) crossed with Locke Lamora or some other scheming sassy gentleman who edges towards the wrong side of ‘honest’ in most transactions. So much wonderful character development to go! I’ll have to admit I’m not as familiar with Gaiman as most of you seem to be, this being only the second novel I read from him (the first one being The ocean at the end of the lane, which I loved, and brought me to get this one and join the read along), but I’m already quite immersed in this story. His descriptions of places, situations and characters are extremely powerful and paint such a clear picture, it’s like being there. I love these moments in a character’s life in which they finally decide to step up and be active about what happens, where to go, what to do next. So I was cheering when Richard grew the pair he so desperately needed and, ignoring Jessica, did the right thing and picked up Door. I couldn’t stand Jessica. “Someone else will help her.”, really?! You see a hurt person -a girl!- lying on the street, blood everywhere, and you so coldly give the task of helping her to the next passerby? Even when she told Richard to call emergencies, it sounded like she was agreeing to give her a kidney! Thank you for your act of kindness, your highness! So, yes, I was glad to see Jessica go. And what to say about this Below London and its characters. It’s all so creepy and mystic and interesting, and I love how Richard pretty much just rolls with it. Of course, he doesn’t believe it all right away, but he doesn’t struggle much with these new ideas either. Someone’s talking to a rat? He’ll believe that in a heart beat. Of course, he’s *seeing* it, but any other person may have a bit more trouble with that (and soooo many other things). He’s such a genuine nice guy, and I felt sorry for him when he became invisible to those in London Above. That must be a terrible feeling, to just, pretty much, stop existing, while still being there. It gave me the chills to no end. Wonderful to have you along! There are a few who are totally new to Gaiman, so reading Ocean at the End of the Lane will give you a good background to his style, however it is interesting to note that Neverwhere was his first published novel, so see how it compares with his more recent work (Ocean) being published some 15 years after Neverwhere.